In this tutorial we are going to show you how you can use the Users Insights plugin to display, search and filter the data saved as custom WordPress user meta fields. The WordPress user meta API allows you to store custom data for each WordPress user. Many plugins use the WordPress user meta to store additional information for the users that WordPress doesn’t store by default. Sometimes you might also need to store custom user data, such as registration forms data and the WordPress user meta is perfect for this job. However WordPress doesn’t provide an option to display the user meta data, which makes it difficult to retrieve the information that has been stored. This is where the Users Insights plugin can come in very useful. For this purpose you can use the Custom User Fields feature of Users Insights. With this feature you can easily create custom user fields that you can update from the user profile section, as well as display and filter in the WordPress user table. The Custom User Fields feature works with the WordPress User Meta API, which means that it stores the data as user meta and it can also retrieve any existing user meta. In order to load your custom user meta data on the user table, just register a custom user field with the same meta key as your user meta field. Before diving into our use case, it’s important to understand what metadata is. Usually, metadata refers to data about other pieces of data. They play an important role in improving organization, clarity and performance, not just in the software industry. For example, if you ever went to a library you probably have seen traditional card catalogues. They are used to hold information about books, such as author, title, location, publisher, category. But at this point things may not be that clear for you. What is metadata in my WordPress site? How do I know I have it? How can I use it? Well, just like our old card catalogues WordPress has its own way of storing metadata. That is done using custom fields. And in our case in particular, the useful metadata we have is stored as custom user fields. These are data points about your data (users) that help you better understand them. Therefore, we can store a lot of additional information about our users and use this later on. But the true secret of the digital version of metadata is that it can be stored automatically. Crucial information such as your customer location and their lifetime value can be fetched from other plugins. Now let’s see a few metadata examples and how to use it. Let’s make our concept of what metadata is even clearer with a few examples. In our WordPress concept metadata can be requested, collected from other plugins, or gathered automatically. It’s possible to request user information, such as their Job Title, company size, or even alternate email address. These metadata examples can be used for marketing campaigns, different access levels, account recovery and more. In case you are using other plugins, it’s very likely that they collect a lot of metadata already. These are often custom user fields for purchase information, courses, activity. The amount of metadata available depends on the plugins you are using, but often plugins rely heavily on them. In this example we set the field type as “Text”, as the Job Title is a text field type. This means that Users Insights will provide text-based filters in the WordPress user table, such as “contains” or “starts with”. Once the field is created, Users Insights will get the user metadata from the WordPress database and it will be available in the fields section of the Users Insights page. 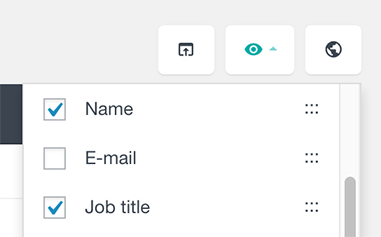 You can make the “Job Title” field visible on the table by clicking on the “Eye icon” and checking the “Job Title” option. If you are not sure about what meta keys are used to store your custom user meta, you can use the Extended CRM For Users Insights plugin. This is a free add-on that provides some extended features for Users Insights. One of the features that it provides is listing all the existing user meta keys in the Custom Fields section. With this option you can find the meta keys that your scripts/plugins use to store the data and select them from the list when creating a custom field. If you want to learn more about the Users Insights Filters, you can visit the Smart Filters page that describes this feature in detail. In addition to the standard text field types, Users Insights also provides a number field type, that can be used with any user meta that stores numeric data. If, for example, you store your users age as user meta with a meta key “age”, you can just create a custom user field with the “age” key and select the “Number” field type. Once created, just like the example above, you can display the data stored for this field, as well as sort and filter the user table by this field’s data. For the numeric field types you can use filters like “is bigger” or “is smaller” to find the users that fulfil a certain criteria. Another field type that Users Insights supports is a date field type. This field type is read-only, which means that it can be primarily used to retrieve existing user meta data, stored in a date format. When a custom user meta field is registered as a date field, you will be able to sort the user table by this field in a chronological order. Here is an example where we have applied a filter to our custom date field to find all the users that were born after a selected date, with the user table sorted by this field in an ascending order. One of the most useful features is that you can filter your WordPress user list by the custom user meta, so you can easily search for your users that have a specific value selected for this field. You may notice that in your results list, user meta fields don’t have the values of 15 and 30. That’s because this is a bigger than X, not bigger or equal than X. Therefore, if you want to include 15 (or any other number) you need to use a different value (such as 14). Just remember that when you use date to search users by meta the “edges” of your search aren’t included. So, if we want to find all users who were born on or after Jan 1st 1980, we would need to use 31st December 1979 in the search criteria. With the Users Insights Export feature you can also export your WordPress user meta data in a CSV format. The export feature allows you to export the data with the same settings applied to the user table, including all the filters applied, visible fields selected and sorting options. This allows you to create a fully customized user export. Whether you use a plugin or a custom script to store custom WordPress user meta, at some point you would need to review this data. 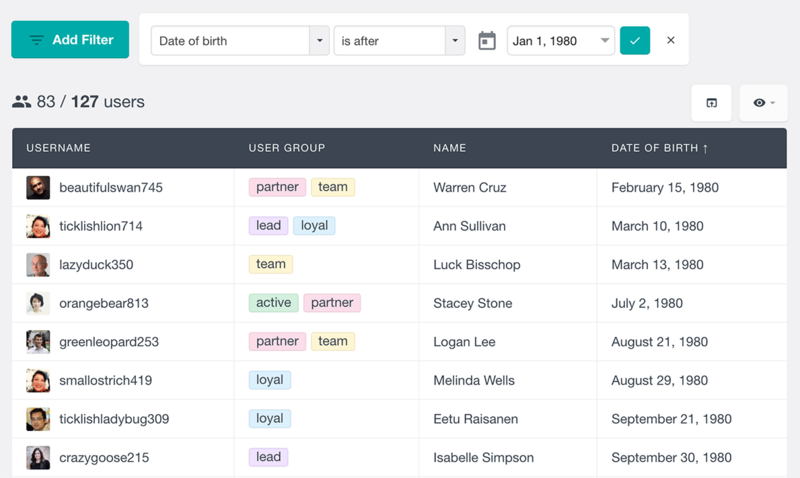 Users Insights gives you the tools to display, search and filter your existing user meta data, so you can easily analyze and make sense of your user data.